It's ready to hit the party scene with bass that hits. Enjoy easy, one-touch connectivity and music streaming with NFC or Bluetooth. Pump up the atmosphere with club-like line and speaker light with strobe flash. LED illuminated speaker. Bluetooth Wireless. Wireless range up to 30-feet. Five (5) multi-colored LED light effects. Headphones & Speakers Marvel Comics. - Speaker lights up when in use. - Powerful sound performance. Simply load your card, USB flash drive or Aux-in cable, and then connect to the unit to get started. Also support FM Radio. KOCASO LED Bluetooth Speaker Dynamic Multicolor. The LED Bluetooth speaker features stable BT connection, powerful dual 3W speaker units and dynamic multicolor LED lights. Bluetooth version: V3.0. Bluetooth call: Yes. Color: Yellow. Type: 1937BT. Product introduction With FM radio and colorful lights;. Wireless light up speaker for smartphones , tablets , notebook computers and other Bluetooth enabled devices. Unit lights up purple! 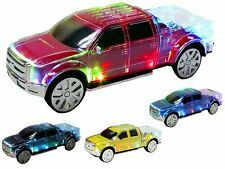 This translucent pick-up truck was designed with disco lights and AUX-IN so you can plug and play with your favorite playback device with the included 3.5mm AUX cable. PICK-UP TRUCK WITH BLUETOOTH. USB to Mini USB Charging Cable. Simply turn on the speaker, and it's in pairing mode. With its backlit LED lit speakers, the SP328 Speaker is perfect for parties or gatherings. Just turn it on and let the music stream while everyone can enjoy the stylish blue speakers. $Enjoy your music anywhere with the black Pulse 3 Portable Bluetooth Speaker from JBL. The speaker has an IPX7 waterproof housing, so you can take it to the beach or pool without worrying about getting it wet. Your listening experience will be unique and colorful, thanks to the glowing LEDs that provide a 360° light show to go with the 360° sound the speaker delivers. With JBL Connect technology, you can wirelessly link more than 100 JBL Connect enabled speakers to amplify your listening experience, or create your own party. In addition, you can shake the Pulse 3 to create a synchronized light show with other Pulse 3 devices. With the JBL Connect app, you can customize the light sequences to suit your taste. The Pulse 3 also features a noise and echo-canceling speakerphone. Brand New Sound Logic Bluetooth Handcannon Light Up Speaker With: -3.5 mm Aux Jack -Microphone -Built in USB and Micro SD slot -Built in FM Radio -Built in rechargeable battery -Built in foldable handles Blast Your Music Anywhere! Folding Light-Up Travel Speakers New. Condition is New. Free shipping in the USA! 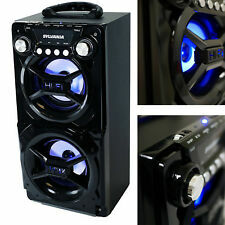 SYLVANIA SP845 Hi-Fi LED Light-up BT SPK. Model: SP845. This SYLVANIA Hi-Fi LED Light-up Bluetooth Speaker is in great working condition. SYLVANIA Hi-Fi LED Light-up Bluetooth Speaker. • 6.5" subwoofer. Wireless Light-Up Portable Boombox from Sharper Image allows you to take the party with you wherever you go. Micro USB charging port (cable included). Max range of 30 feet. Always check the photos for details and if you need more, just ask. Take the party to new heights with a Bluetooth light up speaker. Connect to this speaker wirelessly up to 30 feet away with most Bluetooth-enabled devices, change the mode and tap the top to change between 6 different colors. Bluetooth core LED light up wireless speaker Color Changing Red Blue Green NEW ! Bluetooth core LED light up wireless speaker Color Changing Red Blue Green NEW !. Condition is New. Shipped with USPS First Class Package. Cobys CSBT335RED Lil Light Up Bluetooth Speaker With Auto LED Lightshow is perfect for people who enjoy taking their music lightly. Thanks to its TuneTrance technology, your tunes becomes an eye-popping sound and light show that's always party ready! Just stream your favorite playlists via Bluetooth or slip a MicroSD card into its built-in drive. Plus, its built-in Tunes N Talk makes it easy to go from party to phone call by turning the CSBT-355 into a crystal-clear speakerphone! Be the light of the party with the self-powered, fully rechargeable Cobys CSBT-355. Convenient cordless music and mood light. You can even have the colors flash to the beat of the music! Made of white impact-resistant, durable PE plastic rotomolded housing for a clean modern look. On/off switch. From the Victorian Trading Co Bluetooth Candle Speakeer Romantic and requisite for quite nights or festive gatherings, our candle lifts spirits by emanating a glow and your personal music selection. Rechargeable lithium battery. Measures 5" tall. 3 1//2" dia. Wax, LED. Imported. Cobys CSBT335BLU Lil Light Up Bluetooth Speaker With Auto LED Lightshow is perfect for people who enjoy taking their music lightly. Thanks to its TuneTrance technology, your tunes becomes an eye-popping sound and light show that's always party ready! Just stream your favorite playlists via Bluetooth or slip a MicroSD card into its built-in drive. Plus, its built-in Tunes N Talk makes it easy to go from party to phone call by turning the CSBT-355 into a crystal-clear speakerphone! Be the light of the party with the self-powered, fully rechargeable Cobys CSBT-355. Bluetooth connectivity - compatible with iPhone, Android, iPad and iPod products. Light-up, color-changing LED. Bluetooth range up to 30ft. Flashing LED Lights. 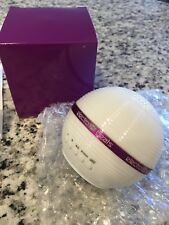 A New iWorld Rave Bluetooth Wireless Light Up Speaker in box for sale. Up to 33 feet wireless audio. Bluetooth Speaker - lights up! 4" Speaker. Wireless operation frequency: 2.400 GHz - 2.480 GHz. Wireless transmission range: up to 32 Feet. FM Radio, Auto Scan. Flash changing light. Output power: 5W. 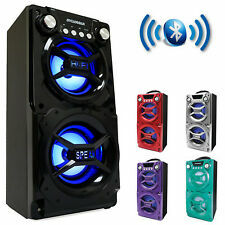 Bluetooth range up to 30 ft. Small size big sound. Unicorn Speaker. Unicorn plush. Bluetooth speaker. Speaker charging cord included. Features : wireless stream music. or MP3 player up to 50 feet. lithium -ion battery lasts up to 4 hours. level to ensure safe listening.